The Buckhorn Inn Restaurant Gatlinburg is an attractive bed and breakfast that offers fine Southern influenced meals with a unique welcoming ambiance. The Buckhorn is surrounded by twenty-five acres of meadow and forest, and features quiet walkways, a self guided nature trail, a sixty foot meditation labyrinth and a fish and duck pond. We wanted to have at least one special dinner out and based on other recommendations, we decided this was our place. When you first arrive, you will find that the dining room area features a comfortable fireplace and great mountain views. You're sure to have a delightful experience just sitting, relaxing and enjoying some real quality time. The Buckhorn Inn Restaurant Gatlinburg serves breakfast between eight and nine thirty, seven days a week for overnight guests only. There was a time when you could make reservations for breakfast at the Inn, but they have become to busy to handle the breakfast crowd. The breakfast menu is unique to say the least. You can choose from options like cheese stuffed french toast, apple cinnamon waffles or wild blueberry sourdough pancakes. Plus you can choose from some healthy options or more typical morning breakfast choices like country sausage, ham or bacon and choice of eggs. Please don’t forget the homemade buttermilk biscuits. And, the servings generous. If you want to make sure you have the fuel for a morning's trek through Gatlinburg, this is the place to get it (you might not even need lunch). No one needs to worry about being hungry at the Buckhorn Inn Restaurant Gatlinburg. There is no lunch menu, however, you can arrange to have a picnic lunch made by the Inn for your mid-day hikes on the trails around the hotel. Dinner is open to the public and features a special four course meal with soup, salad, bread, entree, and dessert, with seating starting at seven every evening. The entire four course meal is priced daily based on what's being served that evening. The menu is unique to each evening from week to week. So check out the Buckhorn Inn Restaurant Gatlinburg website for each week's posted nightly menu, before you visit. I recommend that you make reservations a day in advance, since the Inn is a very popular place to eat. We suggest you arrive a bit early and take a little extra time for the spectacular view from the verandah over looking the mountains. When we arrived they had a nice big fire going in the dining room fireplace. We had a table in the library just off the main room with three other tables. We just love to enjoy the comforting feeling of a fireplace, plus they have fantastic mountain views in the main dining area. Dinner lasts around two hours in a quiet setting, giving you plenty of opportunity to savor your meal. There's no need to feel rushed - take your time to eat slowly, enjoy the delicious flavors, and savor every bite! This is definitely a meal we will remember for a long time, and give yourself the time to relax and unwind from a long day in town. For dinner we had a great menu selection. Dinner started with a green salad with a shallot vinaigrette dressing. Our next course was something I have never tried before, a southern catfish stew. It was actually delightful. The main course was a delicious stuffed chicken breast in a puff pastry and finished off blackberry key lime pie for dessert. Make sure you request the spiced tea…it's delicious. The service is excellent, as we were treated like a cherished guest. Here is a special tip to plan ahead for. The Buckhorn Inn Restaurant Gatlinburg restaurant doesn't serve alcohol, but you can bring your own bottle of wine and pay no cork fee if you'd like to have a romantic dinner. The glasses and chillers were provided by the Inn. Just check out the menu in advance so you'll know what to bring. This restaurant is perfect for couples looking for a romantic evening. However, it may not the best choice for small children who can't keep quiet for long stretches. We met several couples on their honeymoon and others celebrating their annual anniversary. The Inn itself was so quiet that we just naturally kept our voices lowered so not to feel like our conversation was a burden to other guests. 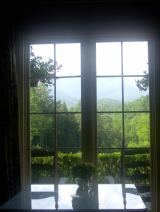 However, after all the noise and lights in Gatlinburg, the Inn is a nice quiet change of pace. Not too far from the main attractions, the Buckhorn Inn is easily accessed from Gatlinburg. There's also great hiking and fishing nearby, so you can clean up from a long day outside and come in for a fantastically relaxing dinner. Or, try a big gourmet breakfast before you go out for your Smoky Mountains hike. We'll definitely be adding the Buckhorn Inn Restaurant Gatlinburg to our list of places to visit every time we're in Gatlinburg.